We often see patients who suffer from cold sores. Nearly 70% of American citizens test positive for herpes simplex virus type 1 (HSV-1) — the virus that causes cold sores. Canker sores and cold sores are different. Canker sores occur only inside the mouth, are not caused by a virus, and are not contagious. Cold sores occur primarily outside the mouth, on the border of the lip. Cold sores are highly contagious. The HSV-1 virus can be transferred to the skin of the fingers, and can infect the eyes. This is why it is important to control the outbreaks, and prevent spreading the virus. Dr. Phillips uses cutting edge sterilization methods to ensure that all patients are protected from any virus — including HSV-1. The virus remains dormant in nerve roots near the infected skin in most people who have been exposed to HSV-1. 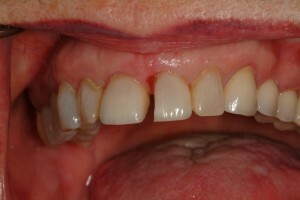 However, about 20% of individuals with the HSV-1 virus experience recurrences called “secondary herpes episodes,” which can be triggered by certain stimuli, such as stress, illness, trauma to the lips, sun exposure or a dental treatment, particularly any dental procedure that stretches the lip. Recent studies have shown that for those people who are particularly vulnerable to secondary herpes episodes, using valacyclovir, prior to having your dental procedure, can help decrease the risk of a recurrent outbreak. If you are susceptible to secondary herpes episodes, (recurring cold sore outbreaks) and have an upcoming dental procedure, we suggest you call us in advance of your appointment to discuss this issue. Together we will determine if a pre-appointment medication, or an acyclovir ointment is necessary or appropriate for you. Dr Phillips has more than twenty five years of experience working with patients to make sure each procedure has the best possible results. We care about the details —and that includes being mindful of, and minimizing the risk of recurring cold sore episodes.